I've struggled with acne for some time now, the struggle is even more real when it come to choosing the right products. There's hundreds to choose from, the list is long and lengthy with brands I just want to shut down when it comes to looking. I usually prefer recommendations when it comes to skin care, since my skin type is some what sensitive, oily and acne prone; I won't just use anything as some products have made my skin worse. 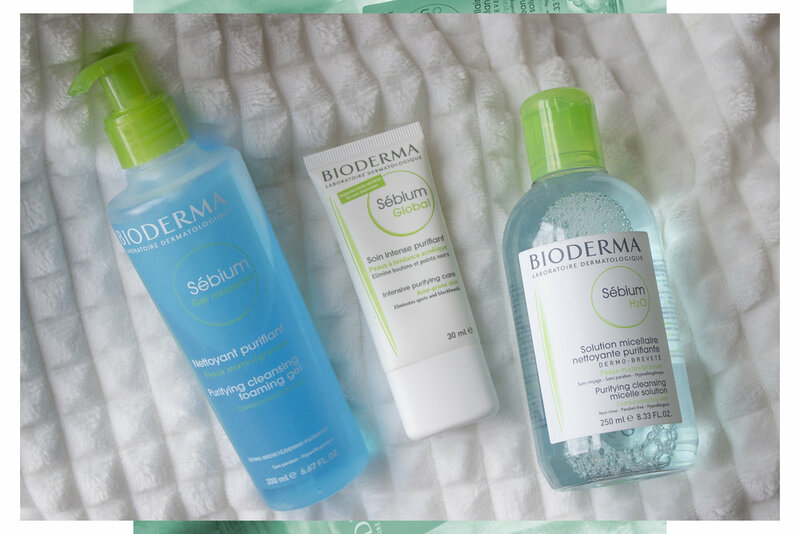 Which brings me to Bioderma, I had previously tried out one of their products which worked well for me so I was aware of their product line and noticed that they cater for oily and acne prone skin. I was excited to give them a another go. Sébium H2O Micellar Water, and sebum global cream. My every day routine would be to first wash my face with the foaming gel which reduces sebum secretion, which happens to be excessive growth of the sebaceous glands which is why the skin creates excess oils. Followed by Sebium h2o micellar water which clenses the skin and reduces and regulates the recreation of sebum. Then last but not least, I'd finish off with using the Sebum global cream which focuses on blemishes, tightening pores and a improves the appearance of the skin so it can preserve its natural radiance. Whilst using these products, I would also focus around the most affected areas on my face, which are my cheeks and jawline. My initial reaction and first thoughts when trying out all three products were how light each products feel on my skin. I did give it around four weeks to really see how effective each of the three products were which I think was a good amount of time to trial them out. I kept a tight regime of morning and night use and stuck to it, using them each one after the other every day. After the first week I noticed that my pores weren’t as oily as they usually were and I could see a slight improvement which was a good sign. Two and a half weeks in I began to see a disappearance in the acne I had been struggling with. Four weeks later my skin appearance was getting better as seen in my before and after photos. In the end I felt quite releaved as its been a long road of trial and error with loads of experimenting. I continued as the weeks went on and the improvements continued, so far so good after a month of usage. I can deffinately say that these products are helping and I am continuing to use them to keep up the way my skin is looking. Along with using my Bioderma trio, I have been drinking two litres of water a day to flush out excess toxins and to keep my skin hydrated. Overall I am very pleased with the outcome and would recommend Bioderma. So if you suffer with Acne like myself be sure to check them out at your nearest Boots store or online click link below to see the full range.